An Orlando man charged with attempted murder in a revenge shooting is waiting to bond out of jail on Thursday, deputies said. 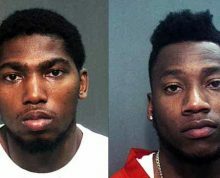 Deputies arrested Eric Griffin and DaQuan Lundy this week in connection with the shooting. A judge set Griffin’s bond at $15,000 after he had been held for nearly a week without bond. The incident occurred on April 27 just before 1:30 a.m.
Deputies said Griffin fired four shots at Treavor Glover, with one shot hitting him in the forehead. Glover said Griffin and Lundy wanted to kill Glover as retaliation for an April 16 drive-by shooting in Parramore that killed a mother and Griffin’s friend Gino Nicholas. “The victim asserted that the taller of the people that shot him is (6-foot-2) and the other person is (6 feet tall). Eric Griffin is (6-foot-9), and that’s a huge difference,” defense attorney Eric Barker said. Barker said the victim’s statements aren’t adding up and that Griffin has an airtight alibi that he was home with his parents at the time of the shooting. “The defense has in their possession some motion detector videos that apparently show the defendant as well as the defendant’s stepfather inside the house during the period of the shooting,” attorney Natalie Stratis-Malak said. Baker said he has records that show the security alarm at the home was set just before 11 p.m. April 26 and was not disarmed until 5:51 a.m. the next morning. He said there is no way Griffin could have left without triggering the alarm. The defense didn’t show the video in court, but did show it to the judge. The judge decided that the video was enough to set Griffin’s bond. Griffin played for several teams in the NBA Development League.